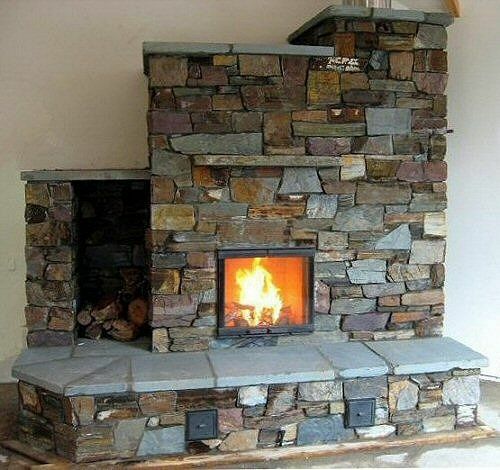 As we discussed on the Masonry Heater page, masonry fireplaces are extremely efficient. However, that's only one of their beauties. Once their basic design principles have been met masonry heaters are quite versatile. 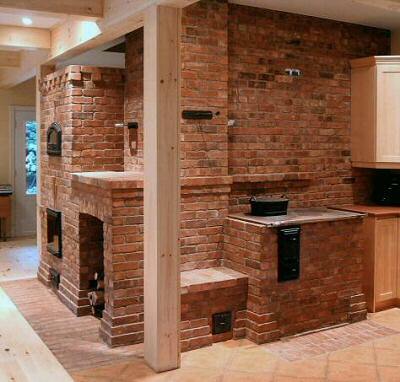 The masonry heater pictures below show just how versatile these units can be. The main requirement is for significant thermal mass. Any number of materials are suitable for that. 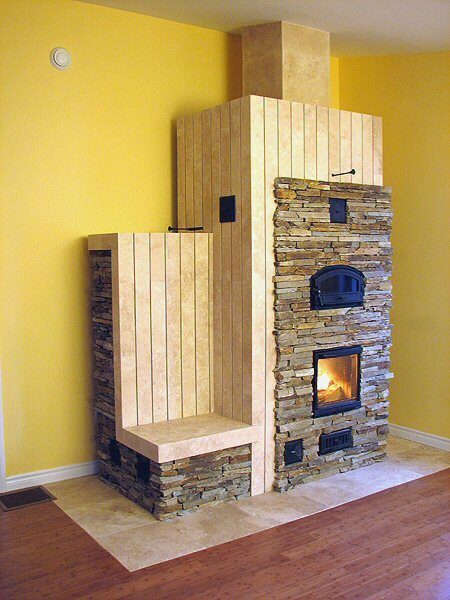 Only the imagination of the homeowner and the mason limit the final result. I love this heater. Beyond just being a source of warmth, it has stove and oven capabilities. Its central location in the home serves its function as a heater well. As importantly, it creates a solid, warm, inviting "heart" of the home. Beautiful. More sculptural, this adobe-style unit softens its mass with round edges. 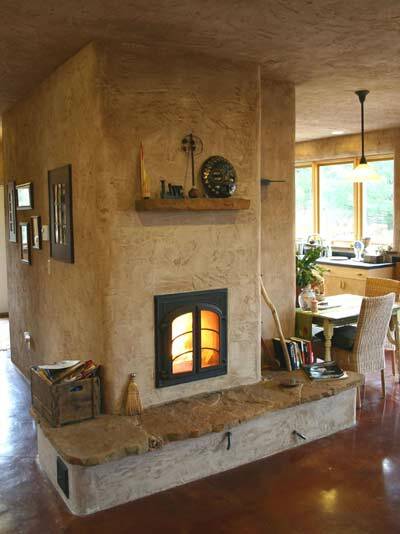 The heater serves to divide the living space while the fireplace part of it acts as the focal point of the home. For my home I'd probably plan something like the one above. But I'd sure enjoy a visit to this home on a cool evening. The heater below gives an idea of how fanciful heaters can be. This one looks like something Gaudi might have done. Whatever the inspiration, it suits the homeowners style and sense of whimsy. This masonry heater has nice proportions and a sense of scale appropriate for the space. 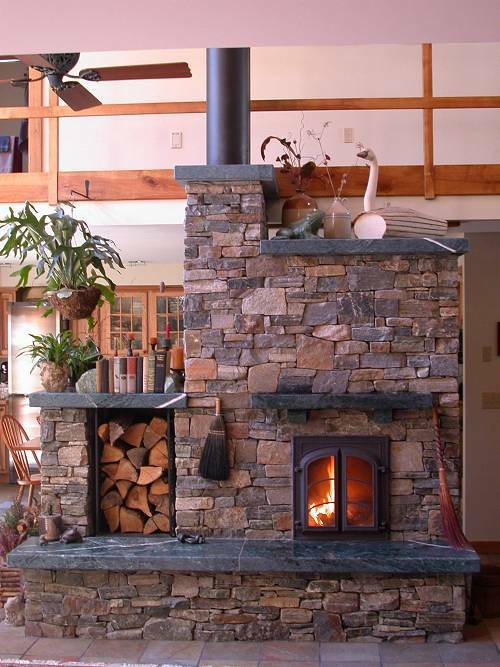 Notice that the stone portion of the chimney doesn't extend to the ceiling. In this particular design, using stove pipe to complete the exhaust path allows the heater to maintain very pleasing proportions. 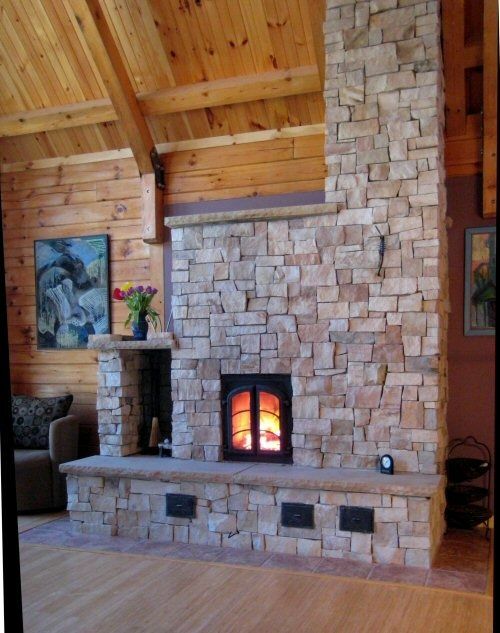 On the other hand, an all-stone chimney can have a very pleasing effect and good proportions of its own. Here's a smaller scale masonry heater. It shows how heaters can retain the charm of a fireplace while being much more energy efficient. I'll be blunt here. This is not one of my favorite examples of a masonry heater. I'm showing it because it makes a point of how varied heaters can be. Also it shows that because of the low exterior temperature of the masonry away from the firebox wood can be in close proximity. Positioning the heater close to a wall isn't best for heat distribution, but you can do it if the house design demands it. 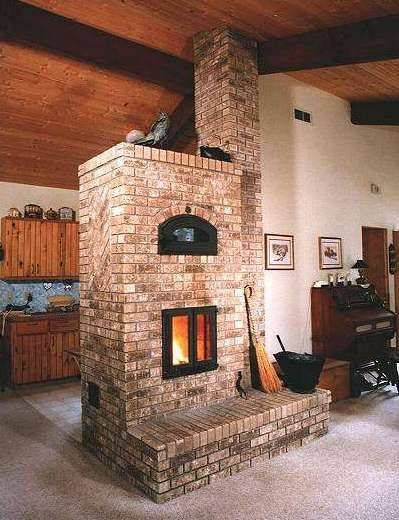 Brick and stone are the most popular materials for masonry heaters. This brick heater shows how effective even a simple design can be. In this situation the heater easily warms the living room and kitchen. Looking at all these heaters reminds me of just how widely adaptable masonry heaters are. I haven't loved every heater I've seen, but I glad owners can have units that suit their taste. There are designs I wouldn't want in my own home, but I sure enjoy the fact that other people have them. It would be rather dull if everything was the same. 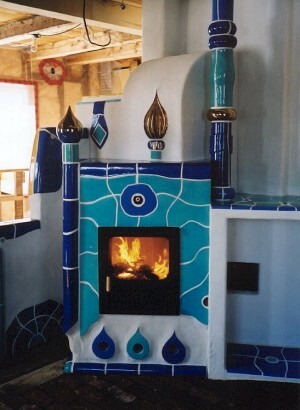 Although many of the units pictured above are completely custom built, prefab units provide a pre-made firebox and smoke path (the complicated part of the construction)that can be finished in the style of your choice. This is generally less expensive than a completely custom unit. It also ensures good function if there isn't a mason experienced in the construction of masonry heaters in your area. Of course, the simplest way to go is completely premade systems. If one of these suite your taste, it's an excellent answer. If you're planning a new home, I hope I've convinced you that a masonry heater is a worthy of consideration.